As some lancets show, the nave and aisles date back to the C13, as does the chancel, but most work now visible is C14. The tower was built in 1883 and there are two fine C14 effigies. The street leading to the church retains much of its village character. The church is rendered and nothing is visibly older than the relatively short C13 chancel, which has a plain tiebeam roof, lower pitched than the nave, lancets and a chamfered south doorway. A square-headed window in the position of a lowside has a pointed rere-arch and appears altered from a C13 original. The semi-octagonal responds of the broad chancel arch are low in proportion to the head and have high bases. The slot on the soffit was for a boarded tympanum behind the rood. This arch dates from around 1300. Most of the nave and aisles appear a little later, but the west lancets of both aisles and the chamfered north doorway are C13, at least in form. The lancets puzzled Ian Nairn (BE p206) as he assumed they were original and thus suggested an unexpectedly wide C13 nave. However, the Sharpe Collection drawing (1805) shows a rather different and broader window on the south side, so this lancet at least cannot be older than the C19, whilst the opening of that on the north side is broader and in the view of David Parsons (2) more probably C14. He is surely correct in suggesting that the lancets were probably remodelled in 1883, when a west tower was built (see below). This is preferable to Nairn’s suggestion that the lancets were reset, which is unlikely so soon after they were first made. The windows of the south aisle and the east window of the north aisle are C14, mostly square-headed with ogee-headed lights and pierced spandrels. The three-bay arcades differ, though both are low in proportion to the height of the church, with expanses of walling at either end. The two eastern bays of the north arcade appear to have been built first. Their double-chamfered heads merge into upward extensions of the abaci of the octagonal piers, a C14 device; the east respond is related. The south arcade also has octagonal piers and responds, but no upward extensions and the north west arch, broader than the others, is similar. As building usually proceeded from east to west, this and the south arcade may be presumed to be rather later. The fine crownpost roof, also C14, shows the nave was completed then, a conclusion supported by the ogee-heads of some clerestory openings. The three-light square-headed aisle-windows are C15; though restored, the larger north west one is of rougher workmanship. Two two-light clerestory openings near the east end, now truncated by the aisle roofs, were probably to light the rood-loft. The renewed three-light east window is late C15, with a depressed head. 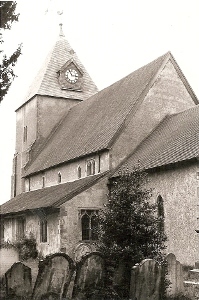 An early C19 picture in the church shows a small timbered west turret. In 1847 D Mackintosh (ICBS) designed a low south tower and porch and repaired the roof. Quartermain in 1859 ((W) p131) shows a roundel in the west wall, which may date from 1847. It could have been moved to the east gable of the nave, where there is now an obviously C19 cusped roundel. In 1883 Somers Clarke junior and J T Micklethwaite (WSRO Ep II/27/171) replaced the tower of 1847 by a west one and extended the nave westwards, providing a new roof. The tower has plain lancets and, surprisingly, is rendered like the rest of the church. Its arch derives from the arcades with octagonal responds. The tall pyramid spire, incorporating bell-louvres, differs from the intended broach spire, though that would also have incorporated louvres (ibid). Font: Late C12 marble square bowl, deeper than most and with plain sides and a moulding round the top. It has a round central base and corner-shafts. These have capitals of four leaves carved into the base of the bowl. There has been a considerable amount of restoration. This is older than any other surviving feature and suggests there was an earlier church. 1. (South chancel first and north chancel windows) J Powell and Sons, 1878; the glass in the south window is by J W Brown (Order book). 2. (West window) Ward and Hughes, 1896 (www.stainedglassrecords.org retrieved on 11/2/2013). 3. (Aisle east windows) P Bacon, 1921-24 (WSRO Facs 2501 and 2770). 4. (South aisle, first and second windows) J Powell and Sons, 1926 (Order book). Lectern: Though probably of 1847, it incorporates early C17 panels. 1. 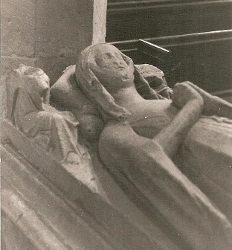 (Under the eastern arches of the nave) Two worn recumbent effigies on quatrefoiled tomb-chests, traditionally said to be Sir John de Ifield and his wife, Margaret (d1347) (Mosse p101). The knight, his feet on a lion, dates from about 1340 and the woman is about ten years later. The male effigy is close to London work, in particular the effigy of John of Eltham in Westminster Abbey; a related figure, from Lesnes Abbey, Kent, is in the Victoria and Albert Museum. The woman is in coarser stone with traces of colouring. Each side of her head is a reclining angel with drapery. 2. (In the churchyard) George Hutchinson (d1801), signed by R Joanes of Horsham, with an urn and a plaque by Coade and Sealy, made of their artificial stone (A Kelly p186). 3. (East wall of chancel) Nicholas Spencer (c1842) by T Marsh (Roscoe p808). 4. (East wall of chancel) Rev S J Lewin (d1842) by T Marsh (ibid). (The prominent position of these last two monuments was common in the C17 and C18, but most have been relocated). Pews: (In the tower) Carved fragments of C17 or early C18 pews, said to have come here in c1760 from St Margaret, Westminster (Dallaway II(2) p382). Piscina: (South wall of chancel) Mutilated C13 trefoil-headed. Pulpit: C19, approached through an opening in the wall, which was probably the lower entrance to the rood-stair. 1. (North tower) Royal cipher of Charles II in a carved wooden cartouche. My grateful thanks to John Vigar, who clarified the whereabouts of several memorials, especially that to George Hutchinson and the two on the east wall. He also drew the Charles II cartouche to my attention.